In Japan, since ancient times, numerous small- to medium-size agricultural ponds have been constructed to irrigate paddy rice fields. Economic growth and urbanization in the modern era have resulted in a decreasing agricultural land area. With the aging of farmers in the country and due to decreasing management efforts, the degradation of the quality of water and the ponds’ environment has become an emerging issue in many regions. 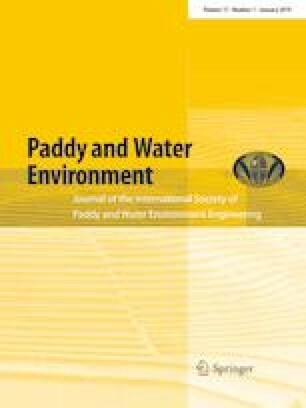 This study was conducted to investigate the status of the quality of water in agricultural ponds in the Yamato Plain, the center of agriculture, politics, economy, and culture of Nara Prefecture, Japan. Water quality data from 71 ponds were collected during 2013 to 2017. The water quality parameters of interest were pH, DO, EC, TN, TP, COD, SS, and Chl.a. Of these, pH, DO, and EC were measured at sampling sites using a portable apparatus, while water samples were collected for the analysis of TN, TP, COD, SS, and Chl.a in the laboratory. The results of the water quality analysis indicated deteriorated pond water for use of agriculture and also for the environment. Principal component analysis was applied to the water quality data for the assessment of the degradation level of the ponds. Results from the analysis showed a dominance of organic contamination. The MCMC sampling method was then applied to develop a Bayesian multiple regression model to quantify the range of correlation between the water quality indicator and pond catchment land use pattern. The model revealed pond water deteriorated with an increased residential area in the catchment, while an increased forest area tends to have a positive effect on pond water quality. The model has the potential to be a useful tool for the management of the environmental quality of ponds. This study was carried out as part of research on water quality monitoring and development of conservation measures supported by Nara Prefecture from 2016 to the present. We acknowledge water user groups and farmers of studied ponds for their support and understanding of our activity.